There have been calls from the Right and the Left over the last several months for Republicans to unite behind a single health reform bill to show how they would replace ObamaCare. I think expecting them to unite behind a single bill is not likely to happen and also a bad idea, as I explained in my Forbes column in December. Republicans first need to explain their vision and principles to the very skeptical American people before they get bogged down in the messy and confusing details of legislative language. Conservative leaders need to start by painting a picture of how their approach to health reform would differ from what the Democrats have offered through Obamacare. Three Republican senators this week offered a plan that does just that. Senators Richard Burr (R-N.C.), Tom Coburn, M.D. (R-Okla.), and Orrin Hatch (R-Utah) on Monday unveiled an outline of their Patient Choice, Affordability, Responsibility, and Empowerment (CARE) Act (with actual legislation to follow). Colleagues have written in-depth pieces here, here, here and elsewhere explaining details of the senators’ plan. And it reflects the thinking of another statement developed earlier this year by more than a dozen of my colleagues in the free-market policy community. More on that in a minute. Leave employer insurance in place: Begin to bring some cost-awareness into the employer-based health insurance market by capping the generous, open-ended tax benefit that gives those in the highest income brackets the most generous employer-provided insurance. This has caused consternation among conservatives, but it is the right policy to begin to cool one of the major cost drivers in the health sector. Modernize Medicaid: Instead of simply expanding access to the worst health care program in America to millions more people, they would reform it by giving states a capped allotment so Medicaid dollars can “follow the patient.” Healthy beneficiaries could escape to better private health coverage. There are many similarities, reflecting the basic agreement among market-based health policy advocates of what needs to be changed. Instead of ObamaCare’s expensive, mandatory coverage, our statement says people should be able to pick the policy and benefits that work in a truly competitive market, not plans overburdened with costly mandates and mountains of red tape designed to satisfy government bureaucrats and not consumers. Our policies would assure people that their premiums will not soar if they get sick or hurt. And that they can maintain coverage if they move, change jobs, or even lose a job. We would go further and allow people to get the same tax benefits no matter where they get their policies. But that is our vision. The Burr/Coburn/Hatch approach starts with providing portable tax benefits to individuals and employees of small businesses, building a foundation for the future. And any responsible health plan must provide for those who have pre-existing conditions. Our proposal assures that everyone can get health care and offers a guarantee that no one will be denied insurance as long as they maintain their policies. High-risk pools run by the states will help in creating a strong safety net for those with difficulty purchasing coverage in the regular market because of their personal health status, and the risk pools would be supported by federal dollars. As you see, there are many similarities to the senators’ plan released this week and also to other plans introduced earlier by Chairman Steve Scalise and Dr. Phil Roe of the House Republican Study Committee, The American Health Care Reform Act, and by Dr. Tom Price, R-Ga., the Empowering Patients First Act. There are, of course, debates over specifics as there should be. But it’s important not to let these differences obscure the much larger agreement around vision, direction, and principles. And they must explain how real people will be helped, offering clear examples, as the Burr/Coburn/Hatch plan does. The American people are seeing for themselves the problems with ObamaCare. We do have problems in our health sector that need to be fixed, but public policy prescriptions need to fit with our economy and follow core principles for health reform that are right for America. The job of Republicans this year is to talk about the policies and principles that unite them on health care. Once the American people see that their vision is much more in line with what they want, and not what ObamaCare falsely advertised, they will then have a mandate to begin the process of true consumer-centered reform. 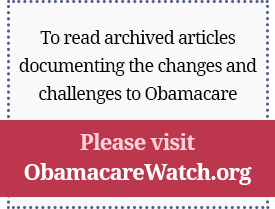 Previous Article: Is Obama Backing Away from Obamacare?